Are Employers Liable for Their Employees? A Florida bartender was arrested after she threw a beer mug at a customer’s head after he allegedly made a comment to her about the length of time she spent in the bathroom. The 28-year-old woman works at the Daytona Last Chance Bar. According to reports from the police, the man claims he waited 30 minutes while the woman was using the restroom. Upon returning to the bar, the man commented that she wouldn’t have taken so long if she wasn’t addicted to drugs. The woman then threw the beer mug at the customer and it struck him in the head resulting in a cut. She’s facing charges for drug possession and aggravated battery. Unfortunately for employers, when incidents like the one above happen, it is often the employer that is held liable rather than the employee themselves. This often happens even if the employer never intended to cause harm and had no active role in the harm of the customer. Two basic concepts are the cause of this. First, employers are seen as being responsible for the behavior of their employees because the employers direct their employees. Consequently, employers share in both the good and bad results of their behavior. Second, if someone is harmed, they typically want compensation. Where is that compensation most likely to come from? The employer rather than the employee. Most incidents that happen like the one above result in the victim suing the employer under the theory of vicarious liability. This is the type of liability that an employer has for any errors or actions of their employees. For example, if a FedEx driver causes an accident, it is typically FedEx that is sued for negligence instead of the employee even though FedEx never intended to injure someone in an accident. Unlike other types of damages, punitive damages don’t seek to repay the victim or make them whole again for their losses. Instead, punitive damages seek to punish the defendant for bad behavior in an effort to keep similar incidents from happening in the future. This is why such damages are hard to obtain. Florida law even prohibits victims from asking for punitive damages at the start of the case, and instead, requires a separate showing to prove to the court that there is a basis for asking for such damages. Although employers are often liable for their employees’ behavior, the court rarely recognizes the employer’s obligation to pay punitive damages when their employee makes a mistake. To receive punitive damages from the employer, the victim must be able to prove that the employee was guilty of an intentional act and then show that the employer knowingly and actively participated in the negligent conduct. 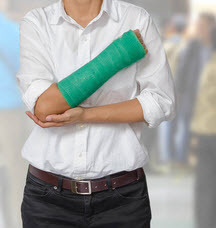 If you or your loved one has been injured by the negligence of an employee or employer, you may be entitled to compensation for your injuries. The attorneys at the Leifer Law Firm have years of experience helping their clients get the compensation they deserve. Contact us today to schedule a consultation.